In ‘The Business of War’, you look at the relationship between privatised warfare and the power of the state in early modern Europe. What parallels can be drawn between then and present day? Private military contractors flourish in periods where states cannot or do not wish to invest heavily in permanent military infrastructure. Setting up dockyards, cannon-foundries, munitions manufacturing, all involve heavy capital expenditure. European rulers initially regarded war as a regular but short-term activity, with these support-services better outsourced to contractors whose services could be flexibly deployed. As the scale and duration of war increased, the costs of raising, supplying and maintaining troops grew too heavy a burden for rulers and their governments to sustain: private contracting was less a choice for flexibility, more a means to keep the war-effort in being by the creation of public-private initiatives, which of course conceded considerable control over military forces to the military enterprisers and to networks of contractors. Today, whether because governments wish to be seen to reduce ‘official’ military budgets, whether because they see potential economies and efficiencies in outsourcing military procurement and supply, the attraction of public-private military partnerships is just as strong. So far though, while weapons systems are built and maintained by private companies, while troops are fed, equipped, transported and housed by contractors, the men and women who are in the state’s direct military service are the only people formally authorized to deploy that military force. Whether illicitly or with unofficial government connivance, private security companies in the service of Western powers cross this line has been a cause of some debate; undoubtedly in many states outside the West the presence of foreign mercenaries, and the harder bargains struck between those financing and supplying troops and the states and rulers acquiring their services, leads to a more blurred distinction between the public and private deployment of armed force. Your book reveals the prevalence of private networks of commanders, suppliers and merchants who conducted war in the early modern period. How does this compare with levels in the modern world? The levels of military outsourcing and delegation reached in the first half of the seventeenth century probably have no contemporary parallel in the Western world. While the modern Western state is moving rapidly towards the outsourcing of almost all military support services, there is no equivalent to general contractors such as Mansfeldt and Bernard of Saxe-Weimar, who raised and maintained entire private armies, nor the sharing of military and fiscal functions between state and private enterpriser seen, say, in the army of Albrecht Wallenstein and his relationship to the Holy Roman Emperor. We are not there yet; even Blackwater – or whatever its present incarnation is now called – does not collect taxes directly in order to pay for its security operations. Based on your research, how effective would you surmise the use of mercenaries and privatised military organisations to be in military warfare both then and now? An essential part of the argument of my book is that we need to be sceptical of knee-jerk assumptions that mercenaries and the reliance on private enterprise for waging war are necessarily costly, inefficient and militarily second-rate. It may be comforting to believe that the state’s direct control of military force has always been the best means to ensure defence and security; however the evidence of the sixteenth and seventeenth centuries suggests that war waged largely by private contractors was more flexible, managed limited resources more effectively and, above all, was better able to relate the ends of war to the means available. When it came to mobilizing complex, international networks to acquire food supplies, coordinate munitions production or transport goods and troops, the ability to tap a mercantile network of considerably greater sophistication than any state administration would tell in favour of early modern contracting. The jury seems out over whether such advantages in know-how and complex networking make as great a difference in securing advantages for a contemporary private sector, but the modern state may have other reasons for wishing to outsource military activities: these may have more to do with managed budgeting and the avoidance of scrutiny than with clear efficiency gains. Have you got any recommendations for further reading? Specialised libraries or collections? Some of the classics of early modern military history certainly complement the story in this book. Geoffrey Parker’s great study, The Army of Flanders and the Spanish Road, presents a detailed picture of an army in which the balance of control and administrative responsibility was firmly tipped towards the Spanish monarchy, yet where private financiers and military contractors played an ever-more important role. John Guilmartin’s Gunpowder and Galleys offers a lively discussion of technology and military contracting in the Mediterranean galley fleets. And for a recent work which revisits the battlefields of the Thirty Years’ War, and provides much stimulating discussion about the wider political-military context, Peter Wilson’s recent Europe’s Tragedy. A History of the Thirty Years War is a key addition to the literature. How does ‘The Business of War’ fit within your wider academic interests and research? I’ve always been interested in the mechanisms for waging war in the early modern period, whether that means understanding military administrations or looking at practical aspects of tactics and operations. The first article I published was a critique of the idea of an early-modern ‘Military Revolution’. My previous book for CUP examined the administration and organization of the French army during the ministry of Cardinal Richelieu (1624-42). 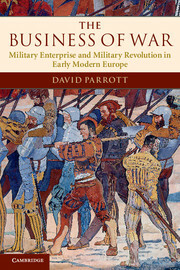 In it I attempted some wider European military comparisons, and argued that France’s reluctance to allow fully-fledged military enterprise amongst its own subjects was a spectacular own goal, one that ensured that France in the decades down to 1660 punched well below her weight in military terms. The present book tries to pull together this general theme of varieties of military organization, though with much further reading and thinking about a wider European context. Libraries – especially the Upper Reading Room of the Old Bodleian. I musn’t be too comfortable, and I need the discipline of uninterrupted blocks of time spent worrying at plans and drafts. Tweet your book – describe it in no more than 140 characters? While states certainly made war in early modern Europe, this book argues that war did not create the centralized, bureaucratic state. My next book will involve a return to seventeenth-century France, and a work examining the political, social and cultural world of those mid-century years which separate the end of the French civil war, the Fronde of 1648-53 and the beginning of Louis XIV’s personal rule in 1661. Entirely neglected in almost all of the existing historiography and simply presented as an uneventful prelude to the reign of the Sun King, the compromises, manoeuvring and military/political crises of these eight years deserve considerably more attention if we are to understand the world that emerged from the 1660’s. David Parrott is the author of ‘The Business of War’ (out now). He is a Fellow and Lecturer at New College, University of Oxford. His previous books include ‘Richelieu’s Army: War, Government and Society in France, 1624–1642’ (2001).